Dr Scott examins a magpie with avian pox mainly on it's feet. This is a ugly disease. Dr Scott has some success with iodine washes and injections. Variety of birds worldwide: upland gamebirds, songbirds, marine birds, parrot family, occasionally raptors, rarely waterfowl. Direct contact with infected birds, ingestion of food and water contaminated by sick birds or carcasses, or contact with contaminated surfaces such as bird feeders and perches. The virus enters through abraded skin. Insects, especially mosquitoes, may act as mechanical vectors. Avian pox can occur in two forms: cutaneous pox and diphtheritic or "wet" pox. In cutaneous pox (the most common form), wartlike growths occur around the eyes, beak or any unfeathered skin. This leads to difficulty seeing, breathing, feeding, or perching. In diphtheritic pox, the growths form in the mouth, throat, trachea and lungs resulting in difficulty breathing or swallowing. Birds with either type may appear weak and emaciated. Warty growths on unfeathered skin, sometimes in large clusters. Size and number of growths depend on the stage and severity of infection. Common sites include feet, legs, base of beak, and eye margins. Often emaciated due to inability to feed. In the diphtheritic form, there are raised, yellow plaques on the mucus membranes of the mouth and throat. The disease can be a significant mortality factor in some upland game bird (fall and winter), songbird (winter), and raptor populations. 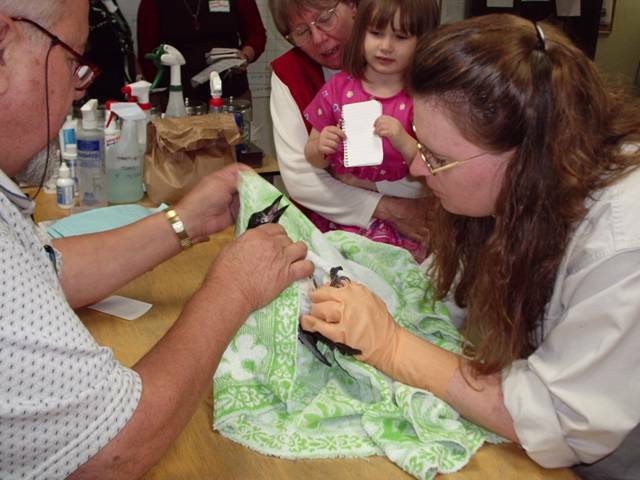 Birds can survive with supportive care, food and water, and protection from secondary infections. Warty scabs contain infectious viral material. Disease control recommendations are site specific, therefore contact the National Wildlife Health Center for assistance. Decontamination of bird feeders, birdbaths, transport cages and banding equipment with 10% bleach and water solution is recommended. In some situations, removing infected birds can be important to reduce the amount of virus available to vectors and noninfected bird populations. Vector control may be considered in affected areas. There is no evidence of human risk. Poultry are susceptible and many are vaccinated against pox. The safety and effectiveness of this vaccine in wild birds is not currently known. Contact the National Wildlife Health Center for additional information on this or any other wildlife health topic.